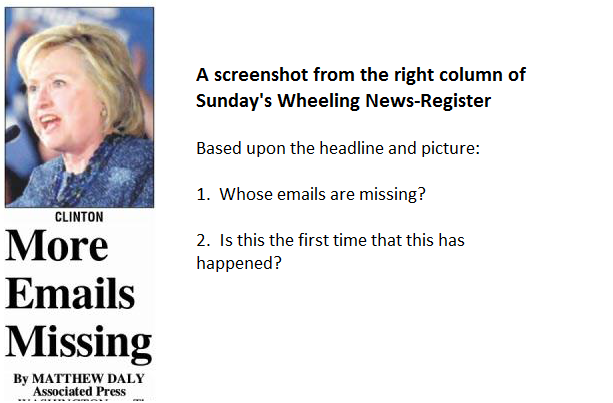 The Wheeling Alternative - Another News-Register objective headline? The department has found emails from Bryan Pagliano's work as a private contractor, spokesman Alec Gerlach said, but the files were created after Clinton left office in January 2013. As I noted here, studies suggest that a majority of Americans never get past the headline. In this case, those readers would see the headline and the accompanying photo of Hillary Clinton and no doubt assume that it was Clinton's emails that were missing (again) instead of emails created by a contractor. The non-reader would also miss what the AP story subtly hints at -- that this search may be part of a Republican "wide-ranging" search for something to pin on Clinton.